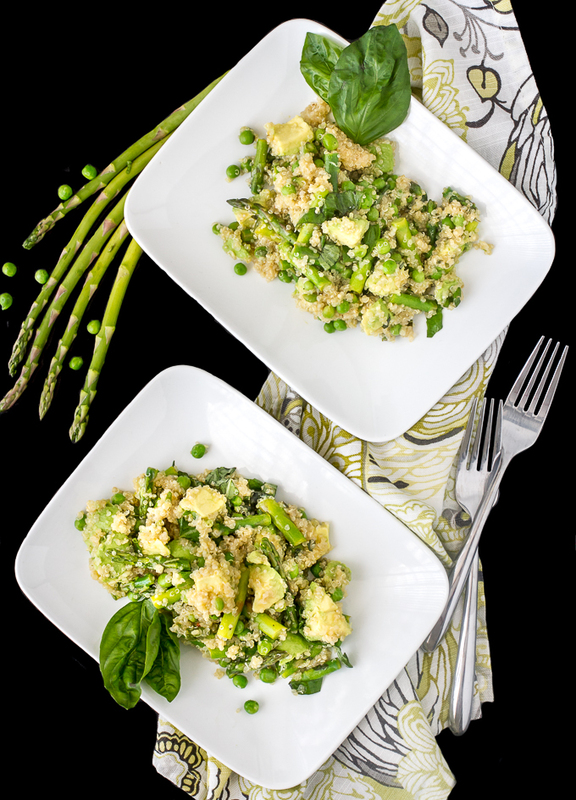 This Spring Quinoa Salad has asparagus, peas, avocado and basil all tossed together in a lemon basil vinaigrette. It’s springtime in a salad and it’s fantastic! Don’t you just love Spring and all the fresh veggies that come with it? I sure do. I get so excited to hit the farmers markets. I love the abundance of fresh, seasonal vegetables. Granted, it’s easy to find spring vegetables like asparagus year round in large grocery stores, but there’s something special about getting fresh, seasonal veggies from a farmers market. I wish I can say I made this salad with fresh veggies from the farmers market, but I haven’t found one yet here in my new home town. You can bet when I do, I’ll be there weekly! Recently, I made this quinoa salad to share with my friends over at Made From Pinterest. The recipe is from Two Peas and Their Pod and it’s a keeper! I really loved the flavors going on in this salad. Fresh, light and perfect for lunch or as a side dish to accompany something hot off the grill! This quinoa salad is equally tasty warm after it’s first put together as well as later on after it’s chilled, which makes it a perfect pot luck type dish in my book. The lemon basil dressing is light and delicious and I loved how the creamy avocado contrasts with the crunchy peas and asparagus. I especially love the little pop you get from the quinoa. When I ate this Spring Quinoa Salad the second day I tossed in some goat cheese that I had in the refrigerator. It was a fantastic addition. I think I’d enjoy it with feta, fresh mozzarella, or parmesan too. But then again, I do love my cheese! Combine the vinaigrette ingredients in bowl or dressing jar, whisk or shake well to combine. Set aside. In medium saucepan add water, salt and quinoa. Bring to boil and continue to boil over medium heat for 5 minutes. Reduce heat to simmer and continue to cook until water is absorbed, about 15 minutes. Remove saucepan from heat. Fluff quinoa with a fork. Heat olive oil in large skillet over medium heat and add asparagus and lemon juice. Quickly sauté to soften asparagus. Add peas and heat through. 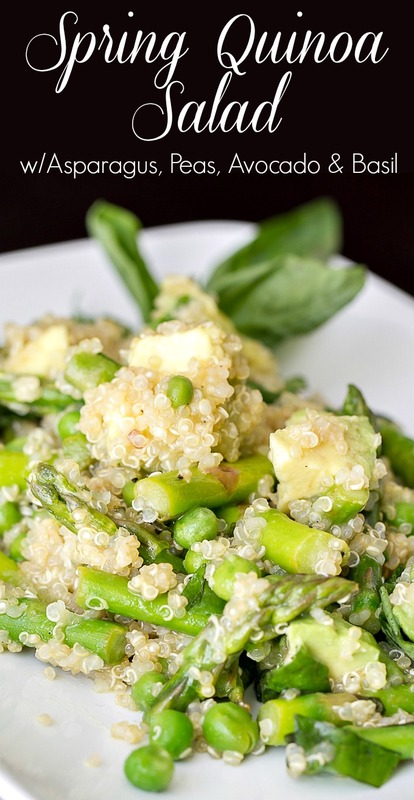 In large bowl, add quinoa, asparagus, peas and avocado. Toss with the vinaigrette. Add basil and salt and pepper to taste. Serve warm, room temperature or chilled. You could also steam the asparagus and peas or blanch in boiling water if you prefer not to sauté it in a skillet. Catch up with me on Facebook, Pinterest, Instagram, or Twitter. I’d love for you to follow along! Lemon and asparagus are the best! This looks so good Judy. Anything with quinoa and avocado = yum! Funny, I threw something similar together the other day. The leftover quinoa, basil and avocado created a perfect combination. The basil popped and added an unexpected flavor. We just loved it. Now to expand on that. My basil plant is growing like a weed so I see many meals with basil in my future! This is my type of salad! With BBQ season around the corner, I cannot wait to break out some of these delicious salads I have been seeing around! Yes, I love all that green – totally makes me feel happy and renewed! I like the idea of folding in some goat cheese for a bit zing and creaminess. Looks amazing. I’m addicted to anything with quinoa these days. I love how it just soaks up the flavors of just about anything you put with it. This dish just screams “Spring is here!” And since I think I have everything on this ingredient list sitting in my pantry/refrigerator, this may be dinner tonight. Thanks for the inspiration! 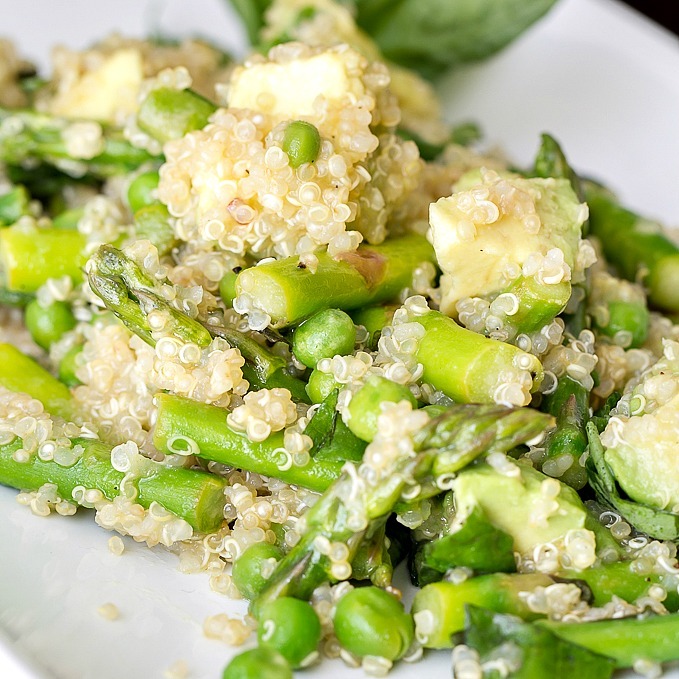 This is so delicious, my favorite foods asparagus and quinoa! Love all the shades of green here! Looks so springlike and festive.